Trees are a beautiful and valuable component of any residential or commercial landscape. 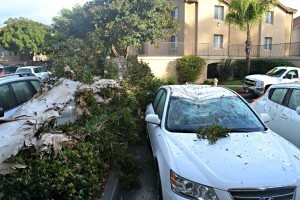 However, each year trees cause significant damage to property and injury to people. In the most tragic of instances, the failure of damaged or dead trees can result in serious injury or death. Many of these tragedies are preventable. The key to preventing tree-related damage lies in early detection of potential tree problems. As a homeowner or property manager, it is vital that you regularly evaluate the health of your trees and/or consult with a professional arborist to perform this service for you. Dead Trees: For dead trees, it isn’t a matter of “if” they will fall, but “when” they will fall. Dead trees should be removed especially when located near a home, office building or anywhere people are present. Dead Branches: Even if the tree is alive, dead branches will eventually fall. 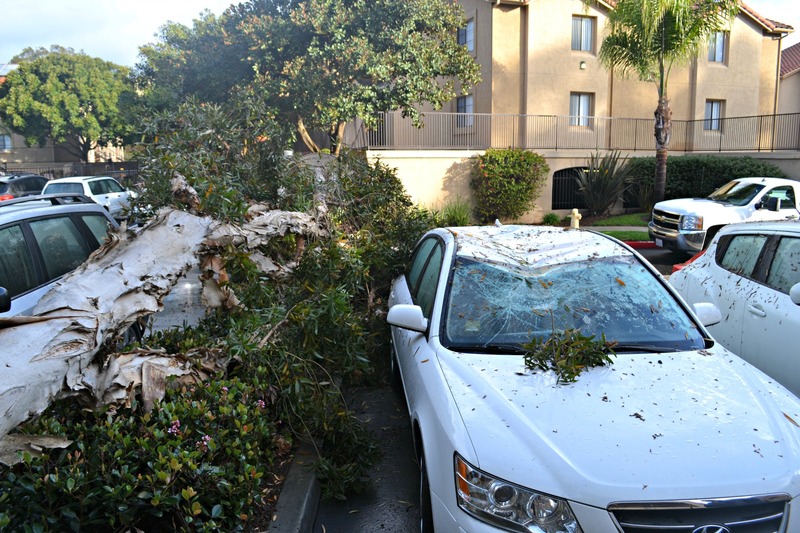 Falling branches have the potential to dent cars, break windows, damage roofs or cause injury. Look for branches with cavities, cracks or splits, rot, or other signs of decay. Cavities or Rot: Cavities or signs of rot at the base of the tree may indicate a weak base. A tree with a weak base has the potential to fall and cause damage. A possible candidate for removal. Mushrooms, Cracks, Splits: Along the base of the trunk or in the canopy, these may indicate a tree with a potential for failure. Degree of Lean: Is your tree leaning strongly toward one direction? Are the tree roots lifting out of the ground? These trees should be evaluated by a Certified Arborist, especially if leaning toward a house, office building or any area with people present. These are merely a few of the potential issues to check for as you evaluate your trees. By regularly assessing your trees yourself and having them periodically evaluated by a Certified Arborist, you may be able to avoid costly damage and prevent or reduce tree removal costs. Remember, early detection of potential tree problems is the key to avoiding serious and costly damage caused by falling limbs and trees. At Emma Tree Service, we always offer free tree evaluations and provide a free estimate for any recommended or requested services. 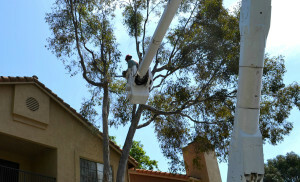 Contact us today to schedule for your free tree service evaluation with an ISA Board Certified Master Arborist with extensive knowledge of San Diego’s many tree species. Removing a tree from your property can sometimes be a costly and invasive project. With this in mind, the professional arborists at Emma Tree Service have prepared the following to help you understand tree removal costs and what you should expect from an arborist when you receive an estimate to remove a tree. The cost to remove a tree from a given location is largely related to the amount of time involved in the removal. Tree location, size, and degree of difficulty are all aspects which can contribute to the amount of time needed to complete a tree removal in a safe fashion. Large equipment such as aerial lifts or cranes are helpful in reducing the time required, but cannot be used effectively or safely in every situation. In most cases, your arborist will determine which equipment is appropriate for your removal and the amount of time the removal will likely take. The use of large equipment, while an associated cost, does not necessarily mean that the removal will cost more. Conversely, most removals involving the use of bucket trucks or cranes are actually less expensive than removals which must be accomplished by sending a climber up the tree and performing complex rigging from a tie-in point on the tree. 6. Specific location: For example, you could generally expect to pay less for a tree removal in your front yard that we can access with a bucket truck than you would for a removal in your backyard that we would need to climb. Please remember, removing even a medium sized tree can be hazardous work, so safety is a top priority with any tree removal. Careful consideration with respect to protection of people and property will factor prominently in the removal methods used, and also in tree removal costs. Do you have a tree that needs to be removed? Our board certified master arborists will be happy to explain the removal process to you, why a particular method may be chosen over another, and how it affects the final cost of your tree removal. Contact us today for a free tree removal evaluation and estimate.